This is the subpart of SacB signal peptide which is commonly used in our BioBricks. Signal peptide is used for the secretion of our protein outside of the cell. Promoter and RBS are compatible with B.subtilis. 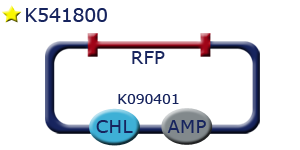 Subpart of LipA signal peptide is designed alternatively for BBa_K541501. Promoter and RBS are compatible with B.subtilis. The aim of design of this part is same with BBa_K541501 and BBa_K541502. This part is compatible with only E.coli because of its promoter and RBS. Tat signal peptide is inserted in this gene. It is same with BBa_K541503. Differently, we used IPTG inducible PlacI promoter with E.coi compatible RBS. LALF subpart that we inserted in our BioBricks which are related to LALF. It has been synthesized in vitro in order to prevent horseshoe crab death, sea creature that hosts LALF. For more information; visit our LALF page. Reflectin is aimed to use as a biosensor in our project. This is the subpart of parts for reflectin. We designed this part in order to stop E.coli growth via B.subtilis. Constitutive promoter veg (BBa_K143012) and RBS spoVG (BBa_K143021) are inserted to be able to use the device in B.subtilis. With help of signal peptide, the protein will be synthesized outside of the cell easily. SacB signal peptide is one of responsible systems in Sec-SRP pathway in B.subtilis. Secreting outside allows us to test whether we could have a solution that does not include any bacterium; thus solution could be used as anti-septic. We tested this effect by comparing the exposure of liquid culture and supernatant of B.subtilis on E.coli. Reflectin 1A, a protein that can be found in Cephalopod iridocyte cells, has the ability to reflect the white light by changing its wavelength depending on the thickness of the protein structure. Because of this, the surface or the cell covered with this protein is seen colorful. This ability, we believe, will allow us to test efficiency of inhibition by LALF. We planned that in the case of prevention of growth, reflectin thickness will be different between experimental and control groups; thus shows that LALF works. Although we want to secrete this protein outside of the cell in order to have a better thick structure output, we also wondered what would happen if protein remains in the cell. That is the reason that we designed this part which does not include signal peptide sequence. In addition, IPTG inducible PlacI promoter and B0034 RBS are included in the part. Besides of inhibiting gram negative growth via B.subtilis, we also wondered what if E.coli synthesizes LALF to stop its own growth. IPTG inducible promoter PlacI and RBS B0034 are selected for this reason in the part, in order to test its effectiveness properly. We added Tat signal peptide sequence to allow LALF to work efficiently. Tat signal system is one of major secretion pathways that exist in gram negatives. This episomal vector has within its BioBrick region a constitutively expressed RFP gene in E.coli. It uses LacI promoter, B0034, mRFP1 (E0010) and B0015. Same gene components are included with BBa_K541515. Only difference here is the plasmid backbone we use. (BBa_I147123) This part is the major sequence that we use in our LALF experiments.